I'm a researcher by trade. But research begets analysis which then fuels the writing of articles and their publication on this blog. Each of these four activities can be separate functions, but – I like to feel – combining them all in the one package gives this blog its special character. Necessarily, it's done on a shoestring and if there is one thing that does provoke my envy, it is the BBC and its ability to send their reporters to the four quarters of the earth in order to track down their stories. But then, what seriously annoys me is that, despite their resources, they still manage to produce such poor results. 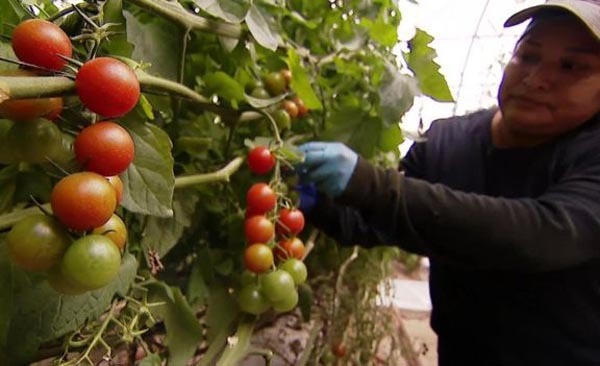 That much came to mind with this report on the effects of Brexit on a Spanish tomato grower, brought to us online by Simon Browning, one of the BBC's business reporters. I watched the same report on the BBC evening television news, and I was pretty sure it was delivered by a female reporter – but then, with the BBC, it's sometimes difficult to tell. Anyhow, assuming it was Simon Browning who did the donkey work, for all his efforts, he comes up with the staggering headline: "Cherry tomatoes could cost 10% more 'within a week of Brexit'". Note the quote marks round the 'within a week of Brexit', indicating the source of the information – somebody must have told the BBC this. But actually, going through the report, and the video clip supplied, there is no identified source for the quote. All we have is Jorge Brotons, the commercial director for Bonnysa, the grower which is featured in the report. In terms of direct quotes, he offers us nothing but generalities. "We're trying to understand what the different scenarios can be. If there is no deal, we'll have to trade in a different way as tariffs will be applied, new inspections and this means we add new processes to current situations", he says. Brotons goes on to say that, "cost in agriculture and margins are very, very tight, and the history of prices shows tomatoes haven't increased in 15 years", adding: "With all costs increasing our margins are so tight - we can't absorb any more cost and any more costs in that chain means losses and having to decide to do something else". As the report progresses, we get to Angel Jiminez (sic), the director of exports at Trota, a logistics firms that sends 200 lorries of tomatoes to the UK every week, crossing into the UK via the tunnel. He tells us that, at the moment, "there is no paperwork involved to cross the border and we can cross easily, but more paperwork means delays. Time is money, more days is more time - and it is the final buyer who pays for everything". However, there is no mention of a specific cost, much less a ten percent increase. Instead, we just get more generalities, bringing us to Justin King, a "former boss of Sainsbury's". He tells us: "The nature of our very efficient food supply chain is there is little surplus cost or margin along the way". That is not exactly earth-shattering information, nor is his additional comment when he says: "The more inefficient it becomes, the ability of suppliers and retailers to absorb that is very limited. They will be passed on to consumers and really quite quickly". Again, there is no detail. Thus, we have a report headline, making a definite claim, with absolutely no evidential support. And to get this essentially fictional claim – which has no more provenance than if it had been made up – the BBC has spent untold amounts of money. The net effect is to show us that tomatoes come from Spain by lorry to England, and that Brexit might increase prices. Even sitting here in Bradford, I think I could have worked that out, and if I wanted a video report on the Spanish tomato industry, there are plenty of YouTube reports. And there are endless trucking videos – you can bore yourself rigid with those. The key issue, therefore, remains unanswered, as to why costs should suddenly shoot up by ten percent. All we have are the clues: additional paperwork and the delays that that might entail – and possible tariffs. As regards paperwork, provided that the UK authorities do not impose phytosanitary checks at the ports of entry (and, so far, they have indicated they will not), then the only additional paperwork will be the customs declarations. But, with the lorries taking two days to get from Southern Spain to the Channel, there should be no problems getting clearance by the time they need to leave France and enter the UK. On that basis, the likelihood of delay arising from additional paperwork seems quite remote – and the processing costs for single product loads will be minimal. We must look elsewhere for our ten percent. There is, of course, the tariff situation to take into account. But here, the charging situation is complicated. If we are adopting the EU tariff schedules, then the amount levied depends on the import price. Data from the EU tariff database (product code 0702000007) show that, currently, the level is set so low that most third country produce comes in tariff-free. And that is without the UK adopting a unilateral no-tariff policy. This probably accounts for the reason why significant amounts of our salad produce comes from countries such as Morocco, outside the EU, and remains competitive with produce grown in EU Member States. Tariffs do not seem to be an issue. Thus, from what we are told by the BBC, it is not possible to work out the source of their ten percent hike. To get there, we have to speculate on additional possibilities, not mentioned in their report. It could be, for instance, that the ports (including the Channel tunnel terminal) get so choked that supplies are massively delayed, thereby adding to the cost of transport. This is something which is possible, even if it is something which the BBC does not mention. All of this points to extremely poor research, and equally poor reporting. And at the heart of that is the research technique adopted. The BBC, like much of the media, insist on trawling for oral "evidence", using that as the basis of their reports. Very often, sources are defined by relevant "prestige" so that, if they want some information on the Spanish tomato industry – they will ask the people from a major Spanish grower. However, while the commercial director of a major grower will undoubtedly know how to run his business, he may be the last person on earth qualified to assess how (or whether) costs will increase as a result of something as complex as a no-deal Brexit, with so many different factors involved. It was not Jorge Brotons's fault in this case, though, that he could not give the answers the BBC wanted. They should never have asked him in the first place – the fault is the reliance on prestige-led oral evidence. When conducting research, or carrying out investigations, there is a hierarchy of preferences based on reliability. And right at the bottom is oral evidence. No competent researchers will rely on this, without corroborating evidence from other sources, or by rigorous triangulating. Mere "desk research" as it is called, carried out in darkest, snowy Bradford, can show up the flaws in the BBC work. But such is the prestige of the corporation that we can expect its ten percent figure to be quoted widely, without the slightest reservations – even though it is entirely unsubstantiated. To be fair to the BBC, though, even it hasn't plumbed the depths inhabited by Spiked Online. If you want the dregs, you go here, to a piece written by Phil Mullan, telling us that: "No Deal is no threat to business", where he asserts that, "Some of the hysterical claims just don't stack up". Whether some of the claims are hysterical or not, Mullan is not wrong in this latter assertion. As we see from the BBC report that I have just reviewed, some of the claims do not stack up. And some are speculative, dependent on conditions that may or may not materialise. On supermarket shelves today there are plums and peaches from South Africa; raspberries, strawberries and tomatoes from Morocco; blueberries and cherries from Chile; melons from Honduras; broccoli from Kenya; sugar snaps from India; and much more from other distant locations. Retailers therefore have plenty of experience of importing and stocking perishable produce from places much further away than the Netherlands, Spain and France. Somehow they cope with all those border controls without everything rotting in a transport hold or on the back of a lorry. Apart from the fact that he conflates long shelf-life products (sugar snaps from India) with perishable goods, and high value air freight (broccoli from Kenya), with strawberries and tomatoes from Morocco, which have little further to go than produce from southern Spain, border controls, per se are not the problem which will defeat UK retailers – at least, not in the way that Mullan imagines. As we have explored so many times on this blog, the dynamics are far more nuanced than simple delays due to additional checks, even if we see the main problems arising from the extension of the EU's third country controls to UK exports when they enter the customs territories of EU Member States. The way this will work, though, is that unless there are measures put in place to manage the flows of traffic, we anticipate that the build-up of unprocessed vehicles will so clog continental ports that ferries and trains from the UK will be unable to unload. Thus, outgoing vehicles destined for the UK will be unable to load – with the knock-on effect that vehicles arriving at UK ports will be unable to travel any further, thereby clogging UK ports and causing the queues. These indirect effects are completely ignored by the likes of Mullan – undoubtedly because they have never thought through the dynamics, and haven't the sense to read EUReferendum.com or Pete's blog. And whether the UK and continental authorities can work together to avoid these problems remains to be seen. But there is no absolute reason why there should be delays at ports either side of the Channel on or after Brexit day. Where we can be certain, though, is in predicting economic effects. With the extension of third country controls to UK goods, and with the imposition of traffic management, the price we will pay will be a substantial fall-off in exports to EU Member States. And that is without counting services, where the losses – for different reasons – are also likely to be substantial. Given the poor quality of research and analysis on the possible effects of a no-deal Brexit, it is almost like shooting fish in a barrel for the Mullans of this world to play down the most obvious effects. But if the delayed economic effects of a no-deal Brexit are not as dramatic as having queues of lorries reaching the M25 and beyond, they are no less serious – in terms of lost value, disruption of production, unemployment and businesses going into liquidation. And then there are the macro-effects: the massive surge in the trade gap, devaluation of the pound, the resultant upturn in inflation and the drop in tax revenues. The nature of these effects is predictable, if not the scale. But the fact is that, with the focus on the more visible – but actually less likely - effects, most of the pundits on both sides of the divide are missing the point. Indeed, the very fact that this is often presented as a binary issue, as between "remainers" and "leavers", is itself a distortion. One could say of this that the misperceptions are the result of shoddy research and poor analyses. But then, since there is no premium on accuracy or well-founded work, why should this even matter? There are enough people content with the garbage they are getting to make it (for the moment) a viable proposition. And, as long as people are content with material which panders to their ignorance, there will be plenty of pundits happy to feed the demand. Of course, if people choose ignorance, they must also choose to accept responsibility for the consequences.